The goal of this preliminary trip was to gather baseline information about the population status and viability of vultures in Ruaha and Katavi national parks and to assess current threats to vultures in the area through informal interviews. Information gathered during this trip will be used to create a long-term vulture monitoring and conservation plan for the region. Raptor abundance was measured using roadside transects. Flying and perched birds were counted along either side of the road. Transects were treated as lines and the distances measured with the vehicle odometer. Transects were driven along main roads and other paths, traveling at 15-50 kilometers per hour. Four to five observers were present during all transects. All transects were completed on days of no rain and between 9:00 AM and 5:00 PM, which are the peak activity periods for most scavenging raptors, especially vultures. All transects were conducted in Katavi and Ruaha national parks from 16-24 August 2013. Transects were chosen to optimize the likelihood of observing vultures and included areas where vultures sightings were reported, as well as areas along the rivers. The data gathered should thus represent the higher end of estimates for vultures in the region. We conducted four transects totaling 203 kilometers in Katavi National Park and three transects totaling 241 kilometers in Ruaha National Park. 190 and 238 raptors were counted in Katavi and Ruaha national parks respectively. White-backed vultures were the most common raptor in both parks, followed by Bateleurs. Hooded vulture and White-headed vulture abundance appear to be high, particularly in Ruaha National Park, and is greater than that found in Masai Mara National Reserve. However although Lappet-faced vultures were seen in both parks, abundance was low and less than that seen in southern Kenya. No Ruppell’s vultures were seen during this trip. We opportunistically looked for nests following information from guides and rangers. We found five active White-backed vulture nests in Katavi and two active White-backed vulture nests in Ruaha National Park. 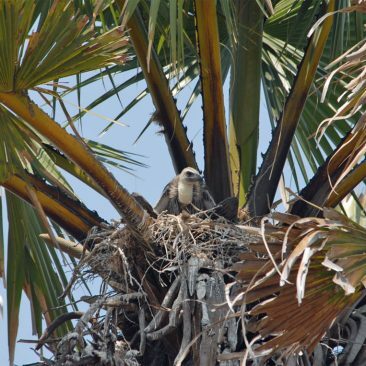 In Katavi, all the nests were in palm trees and had large fledglings, suggesting that fledging may occur in September or October. In Ruaha National Park, in addition to the two confirmed nests, we saw five additional possible White-backed vulture nests with birds nearby and signs of guano, but we could not confirm presence of a incubating adult or fledgling on the nest. These nests were generally in palms and various Acacia species. No nests of other vulture species were seen and there was only one report of a Hooded and White-headed vulture nest. Liz Baker, who maintains the Tanzanian Bird Atlas, had only seven breeding records of White-backed vultures in Ruaha National Park. Both Ruaha and Katavi National Park have considerable woodland areas with suitable trees for nesting of several vulture species. Aerial surveys may be necessary to discover further nesting areas, given the inaccessibility of many parts of the park. Further efforts to determine nesting density in these two parks will be important for assessing the breeding status of vultures in the region. In Katavi National Park, we talked with three rangers as well as with the Chief Park Warden, the Chief Veterinarian, and the head of anti-poaching patrols. In Ruaha National Park, we talked to guides at five lodges, rangers at three ranger posts and to the Chief Park Warden and Senior Park Warden. In addition, we talked with Rob Glenn and Sue Stolberger, who each have been living in Ruaha National Park for several years, and to Liz Baker, who manages the Tanzanian Bird Atlas. We also talked with Claudia Stommel, who is currently conducting research on the impact of the drying of the Great Ruaha River on mammal populations. In general, people with multiple years of experience in Katavi or Ruaha felt that vulture populations were either stable or decreasing slightly. Initial discussions with rangers and guides suggest that poisoning is not occurring regularly inside either Ruaha or Katavi. In particular, it appears that poachers are not using pesticides on carcasses, though poisoning of elephants as a means of killing them is known and could impact vultures. In addition, there were reports of poisoned waterholes to kill fish, though the potential impact of this behavior on vultures is unclear. 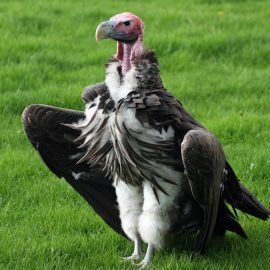 There were a few reports of vulture heads being taken by poachers, and some rangers suggested that these body parts may be used in Tanzania as well as sold outside the country. These accounts are worrying and require further investigation. 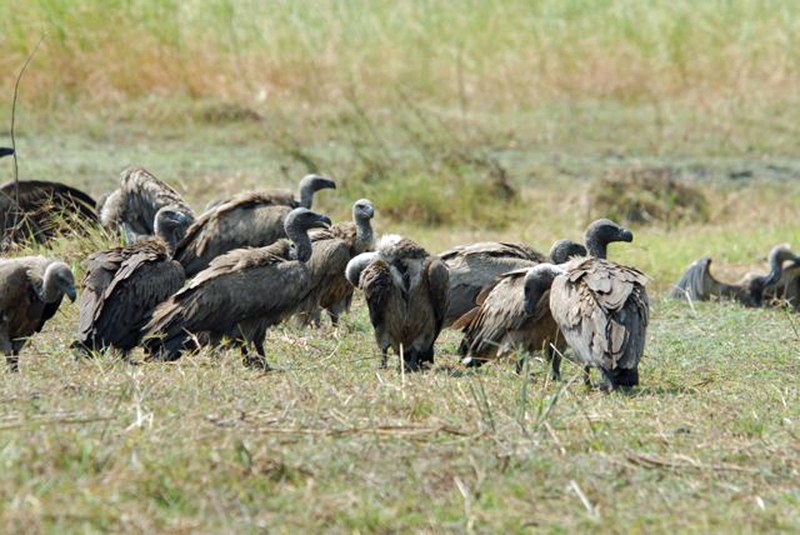 Abundance of vultures is high in southern Tanzania and appears to be similar to abundances found in southern Kenya. Ruaha and Katavi national parks are clearly important ecosystems for vultures, particularly the White-backed and Hooded vultures. Interestingly, abundance of White-headed vultures is higher than Lappet-faced vultures, and some guides have confirmed this finding. This is likely related to the habitat and wildlife composition of the area, but the issue merits further consideration. Given White-headed vultures’ typically low abundance, this suggests that Ruaha National Park may be a particularly critical habitat for this species. Consenus from local informants is that vulture populations in both Katavi and Ruaha were either stable or decreasing slightly. Unfortunately there don’t appear to be any historic records of vultures in either park, making population trends impossible to verify. Threats in the parks appear to be limited. Given the large range size of vultures, it will be important to assess threats to the species outside the park as well. Our findings suggest that Ruaha National Park in particular may be an important stronghold for several endangered vulture species. Given the proximity to Katavi National Park, some vulture populations, particularly White-backed vultures, may be ranging across both protected areas. It remains unclear where the majority of breeding activities are concentrated. Limited threats in the parks mean that current vulture conservation efforts should focus around the park. Monitoring these populations in the park is crucial, given vultures’ susceptibility to rapid decline should poisoning or persecution incidents increase in the area. A key step in vulture conservation in southern Tanzania will be to set up long-term monitoring. There are several options that might be feasible. In particular, vulture numbers at carcasses could be counted by lodges, rangers, and other researchers in the area. While it is difficult to establish density from carcass counts, these will provide vital information about the health of vulture populations in Ruaha and Katavi. Lodges and rangers could also begin noting vulture nest sightings to help build a database about vulture breeding activities in the parks. In addition, it would be important for rangers to note the existence of any vulture parts at poaching camps in order to begin tracking the level of persecution of vultures in the area. Ideally, additional surveys and more systematic searches for nests should be conducted to further establish abundance and to monitor population trends. 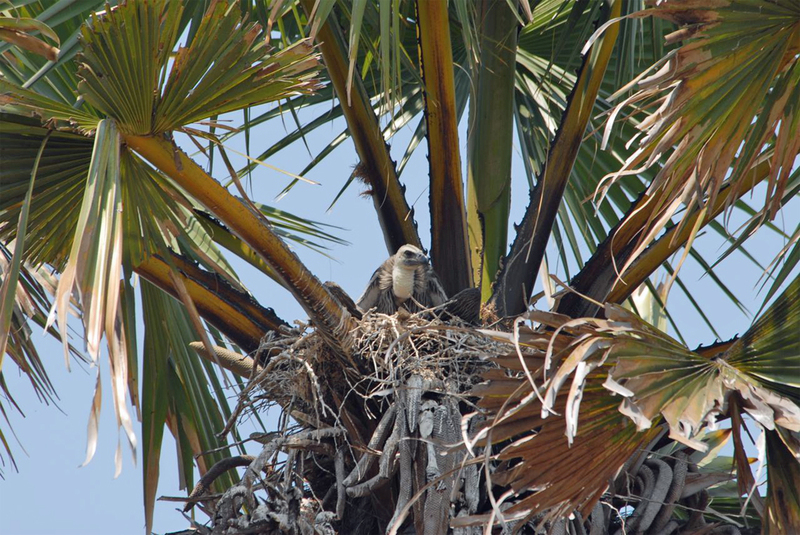 Aerial surveys to search for nests could be particularly beneficial, and it might be possible to tie such surveys in with other aerial activities. 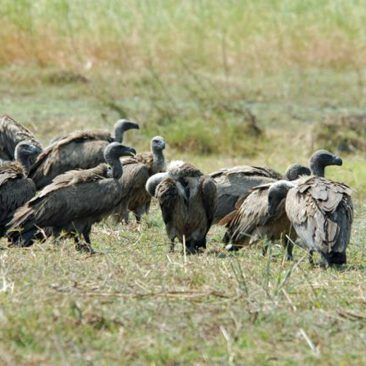 While threats to vultures within Katavi and Ruaha parks appear to be minimal, further information is needed about possible threats—particularly poisoning—outside the parks. We hope to better establish the extent of poisoning through continued discussions with Ruaha Carnivore Project. In addition, further interviews with the communities are necessary to establish the distribution and extent of poisoning and persecution of vultures in surrounding areas. 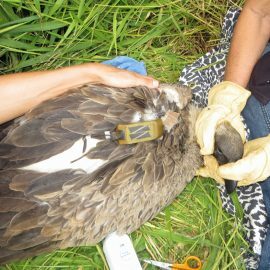 Satellite telemetry, as well as wing-tagging, are important tools for vulture conservation. These tools will help establish relevant population ranges or neighborhoods, uncover important breeding sites, and establish principle mortality causes and rates. The use of telemetry to establish the population range of vultures in Ruaha and Katavi national parks will be key for determining the most important sites for future monitoring and conservation.